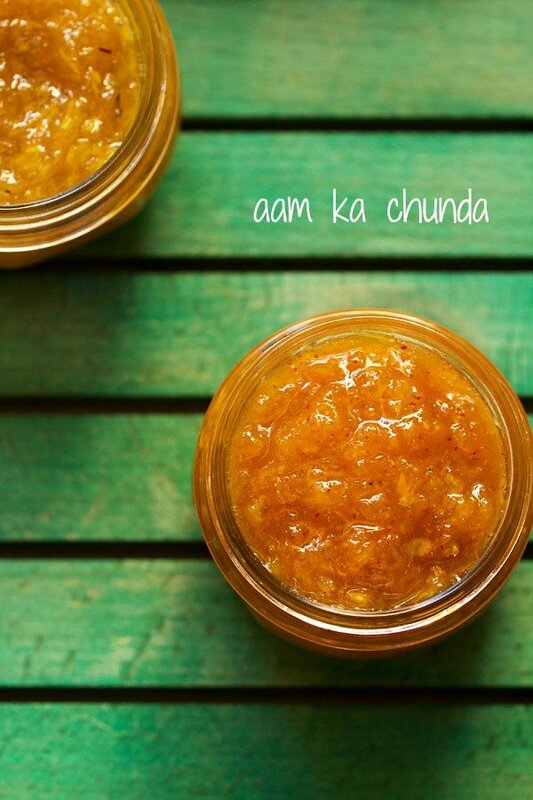 aam ka chunda is a spicy, sour and sweet mango preserve made with raw unripe mangoes and spices. aam chunda recipe with step by step pics – quick, easy and tasty mango chunda recipe. 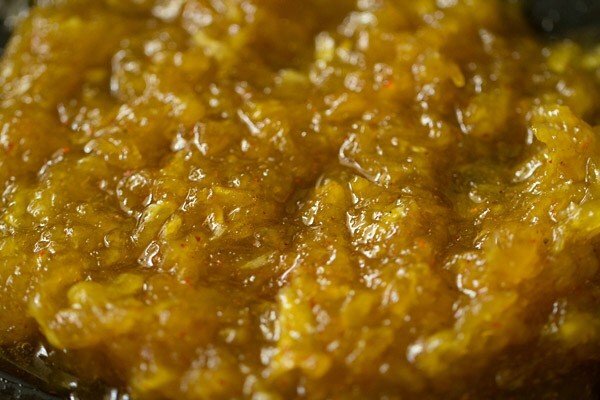 aam ka chunda is a spicy, sour and sweet mango preserve made with raw unripe mangoes and spices. i had made aam chunda when i had made aam ka murabba. 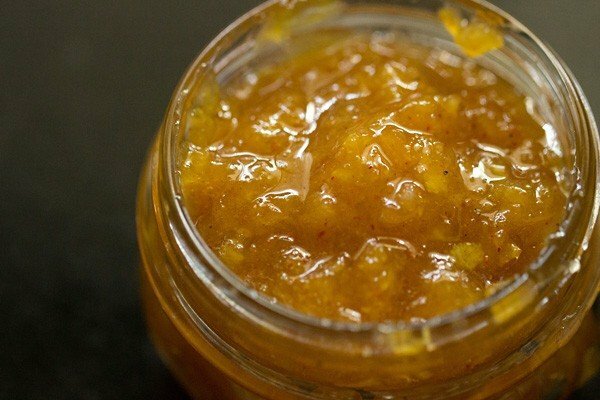 the method is same but a few spice powders added in this mango preserve makes a difference in the final taste. the spice powders i usually add are roasted cumin powder and red chili powder. 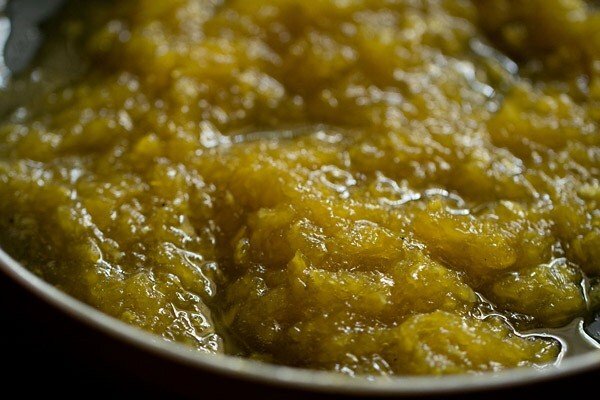 traditionally both chunda and murabba are made by keeping the mango-sugar mixture in a glass jar in sunlight. 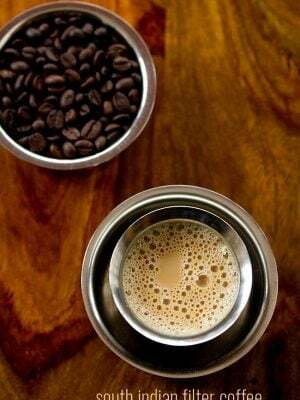 the intense sunlight of the hot indian summers, cooks this mixture. within some days the chunda or murabba is ready. 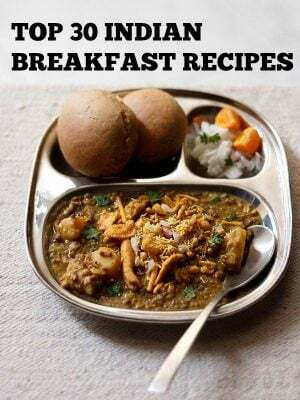 like the murabba recipe, this is quick version that is made on stove top. 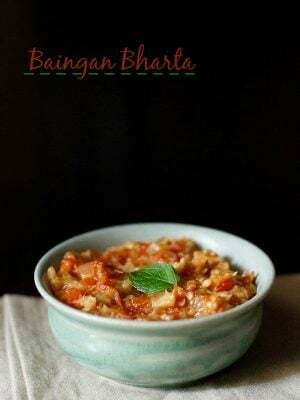 i have also posted gajar ka murabba recipe. 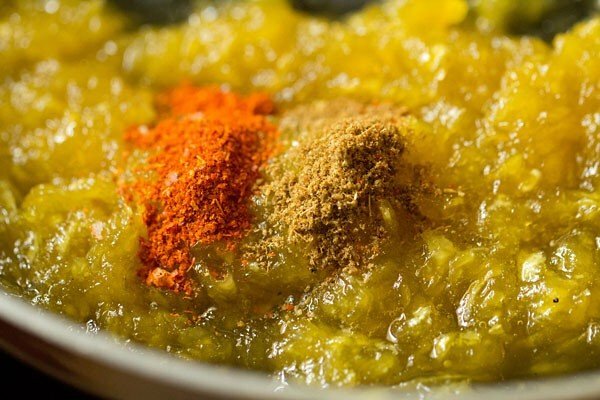 serve aam ka chunda as a side condiment with a gujarati or north indian meal or you can also have it with chapatis, methi thepla, lauki thepla, mooli thepla, pooris, dhebra or rotis. 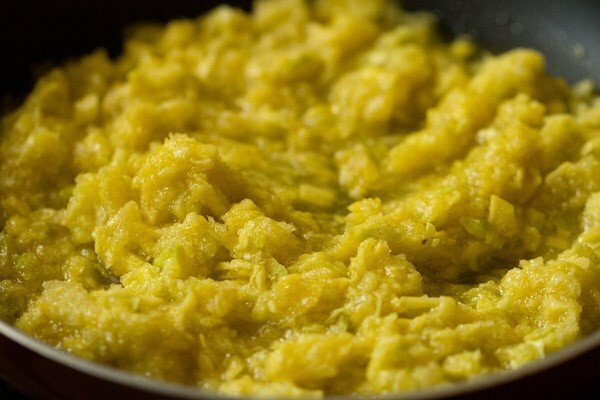 in a pan take the grated or shredded mangoes along with sugar and 1/4 tsp salt. addition of sugar depends upon the tartness of the mangoes and your taste. i added 1.5 cups sugar. you can also add powdered jaggery instead of sugar. i used organic unrefined cane sugar. on a low flame or sim, cook this mixture. initially the sugar will melt and consistency will be watery. stir often so that the sugar does not crystallize and keep on simmering the mixture. when the sugar syrup will start to cook, you will see the mixture bubbling . keep on stirring and cooking. when the consistency of the sugar reaches a 2 thread consistency. switch off the flame. if you cook more, then the chunda gets a thick sticky hard consistency. the consistency should be like a jam consistency and look translucent. there should also be a slight crunch in the mangoes. lastly add 1/2 tsp red chili powder and 1/2 tsp roasted cumin powder. you can also more red chili powder if you want. mix very well. cool aam ka chunda completely. once cooled, spoon mango chunda in a clean sterilized glass jar or bottle. serve aam ka chunda as a side condiment with a north indian meal or you can also have it with chapatis or rotis. 2. grate or shred the mangoes. 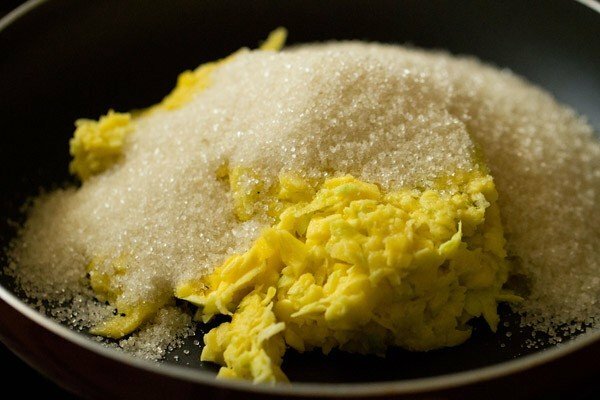 3. in a pan take the grated or shredded mangoes along with sugar and ¼ tsp salt. addition of sugar depends upon the tartness of the mangoes and your taste. i added 1.5 cups organic unrefined cane sugar. you can also add powdered jaggery instead of sugar. 4. switch on the flame. 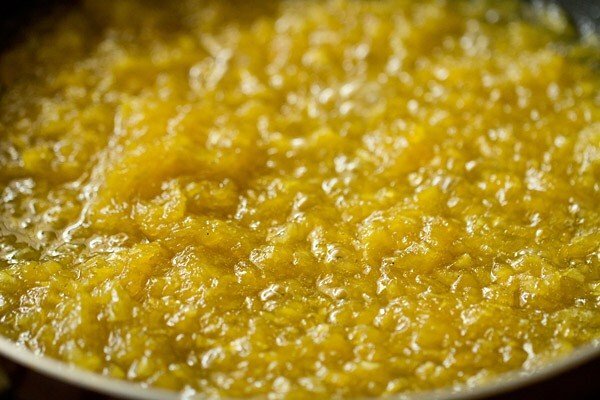 stir this sugar+mango mixture very well. 5. on a low flame or sim, cook this mixture. initially the sugar will melt and consistency will be watery. 6. stir often so that the sugar does not crystallize and keep on simmering the mixture. 7. when the sugar syrup will start to cook, you will see the mixture bubbling. 8. keep on stirring and cooking. 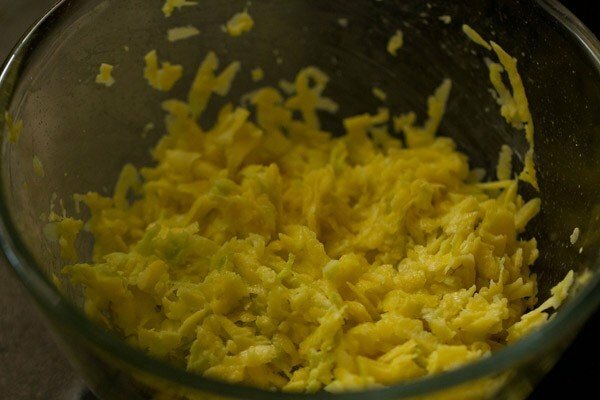 9. the mixture will begin to thicken. 10. when the consistency of the sugar reaches a 2 thread consistency. switch off the flame. if you cook more, then chunda will become dense and hard. the consistency should be like a jam consistency and look translucent. there should also be a slight crunch in the mangoes. 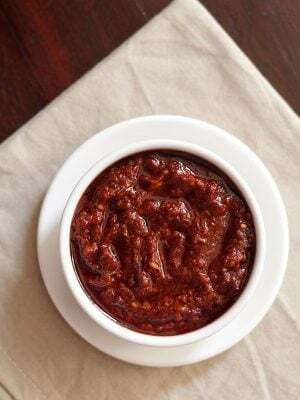 11. add ½ tsp red chili powder and ½ tsp roasted cumin powder. for a spicy chunda, you can increase the amount of red chili powder to 1 tsp. 12. mix very well and cool aam ka chunda completely. 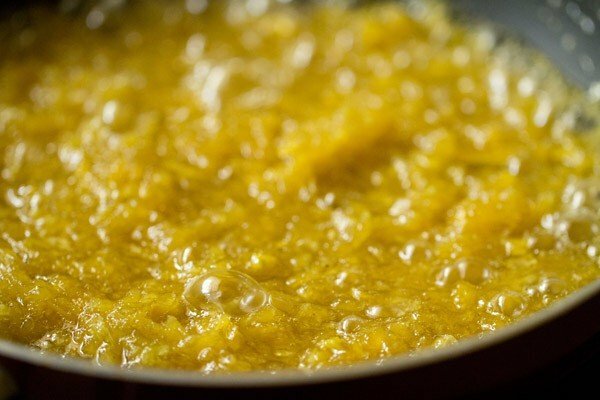 14. once cooled, spoon mango chunda in a clean sterilized glass jar or bottle. 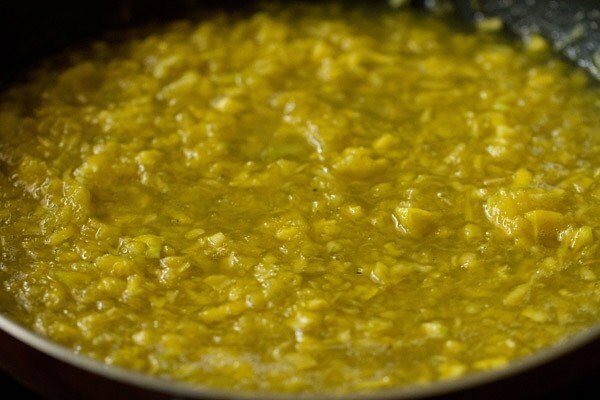 mango chunda stays good for more than 3 months in the fridge and about 15 to 20 days at room temperature. 15. serve aam ka chunda as a side condiment with a gujarati or north indian meal or you can also have it with chapatis or rotis. 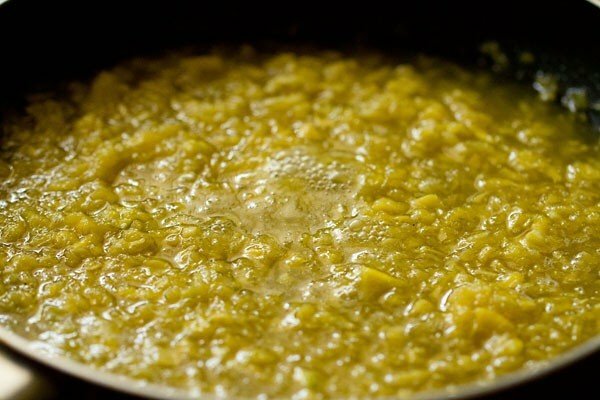 Hi dasana, I made aam chhunda by ur recipe of 7 kg Raw mangoes , I followed the steps but it turns hard !! 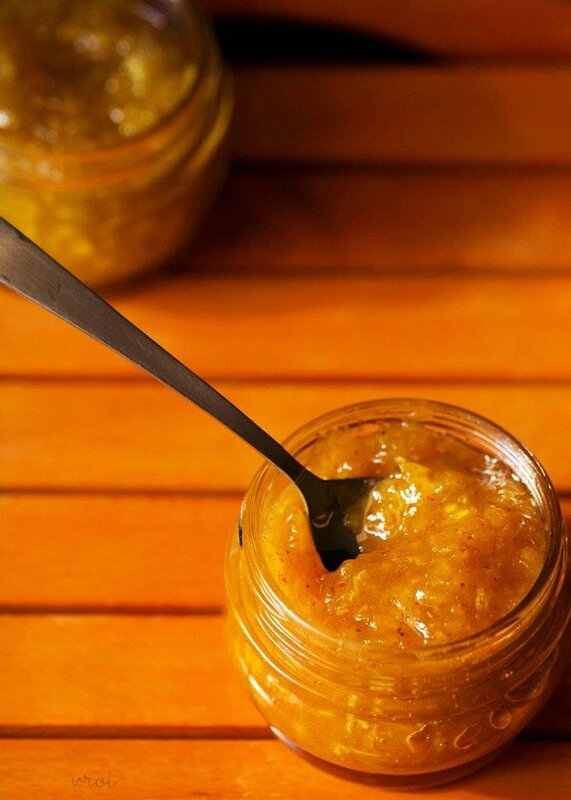 Tell me something to remove that hardness & make it again in smooth jam condition . madhuri, the chunda has got cooked too much. what you do is take all the chunda in the pan. add water as required just to liquify it. then begin to heat on a low flame and stir continuously. the hardened sugar will dissolve in water and the chunda will come to a liquid consistency. continue to simmer and cook till you come to the 2 thread consistency. then switch off the flame. for checking, just take some of the sugar syrup from the sides in a spoon. let it cool a bit and then with your fingers check the consistency. Hi Dassana, I am newly married with zero experience in cooking and your website and the amazing recipes are godsend for people like me. I tried this chhunda recipe and it came out perfect. Since the mango season is about to end, I was thinking of making a huge batch and relishing for the rest of the year. Can we make and store it for long and if yes, then how? Should it be kept in fridge or in the freezer and in what type of container? Please help. Thanks a lot in advance. thanks a lot arunima. 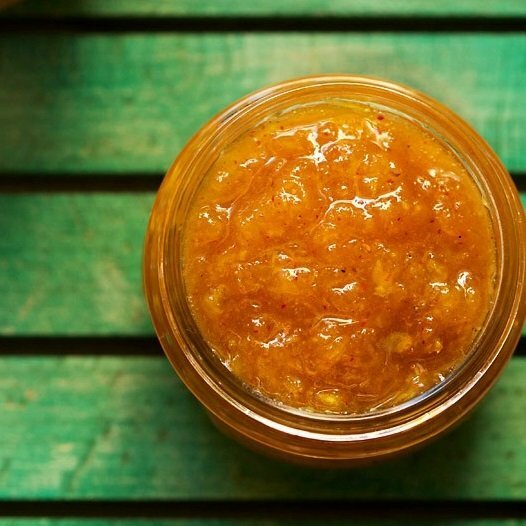 definitely, you can make a huge batch of aam chunda. it stays good for a year. yes do keep in the fridge. glass is always better for storing and preserving. so if possible use a glass jar. Hi Dassana, I have tried several of your recipes and each and every one of them have turned out fabulous. Infact,at vegetarian dinner parties, I have dished up complete menus with your recipes and they have always had excellent comments. You are indeed a blessing for every new cook keen to learn cooking, many housewives and working mothers am sure. God bless you, your family and your work. thanks a lot ash. so nice to read your comment. the chunda recipe has got cooked a too much. just add some water in it and again reheat it, till it comes to the desired consistency. the sugar thread will break down with water, when being heated and go back to the melted stage. thereafter again the sugar syrup will start thickening. thank you meveera. 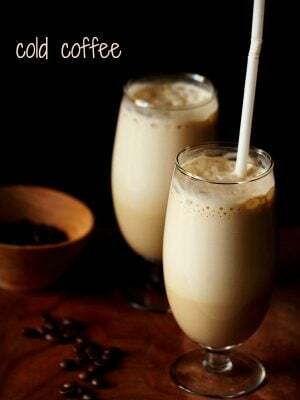 so sweet of you to share the recipe. will give a try if possible this summer as my hands are full. lets see. but have noted it down. Hi Dassana, I stay in US. And here getting mangoes is a boon, I got a mango which looked green I in color but its little ripened from inside and it tastes bit sweet. Can I make this chunda with that mango or can you suggest me something. Also I don’t have good sunlight here so what can I do. divya, you can make chunda with this mango. just reduce the sugar a bit. you can even make aam ka panna. aam ka panna can be made both with ripe as well as sour mangoes. either you cook mangoes in a pan or pressure cooker or roast them on direct flame. the cooked version of aam ka panna i have already shared on blog, its very easy to make aam ka panna. Can you plz post the method of keeping the glass jar in sun. gauri, i will try to add the glass method. but not sure if i will be able to make chunda this summer. but i will give a try. thanks a lot kashmira. i do plan to add fafda in some time. 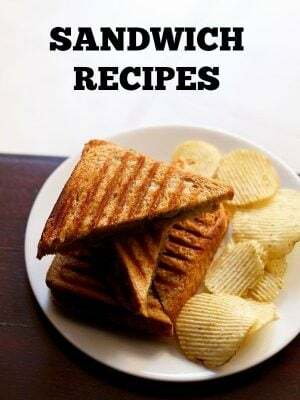 it is on my to do list, but not got enough time to prepare the recipe. The recipe is too good..i am also trying the traditional method to make chunda i.e. i am keeping it in sun.it has been a day and there are still small sugar crystals present in chunda.. When my sugar will completely dissolve? If in case it doesn’t, what so i need to do..
just keep in strong sunlight and for some more days. after a couple of days, the sugar crystals will dissolve. 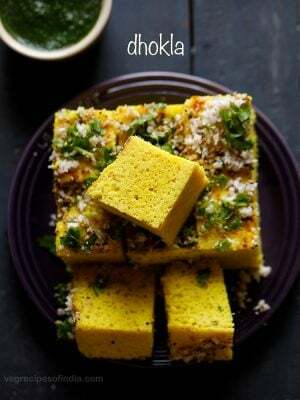 i want to ask you something..what’s the difference between rava dhokla and rava idli?? sorry to ask the question in another post..in these two post there is no comment box and i have to clarify my doubt..and i’m a big fan of your website..you are like a rockstar for beginner cooks. .
thanks debarati for the rockstar comment. the preparation looks same, but the difference is in the taste as we use different spices to make both of them. Chunda is one exception where coarsely ground raw cumin tastes better than roasted cumin. Do try! thanks ruchi for your suggestion. you are right simmi. 2.5 to 3 cups if for blanching the cauliflower. i blanch cauliflower since we get insects or worms in them at times. you can skip if there are no insects in the cauliflower. i think then 1 to 1.5 cups is enough for pressure cooking and 2 to 2.5 for cooking in a pan. i will update the post. thanks for letting me know. thanks for sharing your experience riya. i have noted down your recipe request and will try to add the salsa recipe. 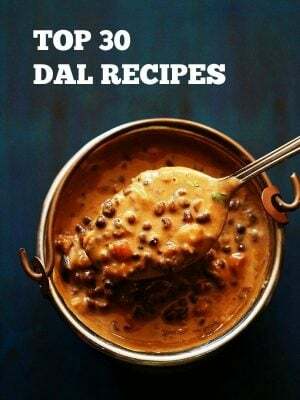 its not added in the dal makhani recipe. I generally don’t add turmeric to this recipe when i make at home. If you want you can add. Sorry to leave you comment on this page but couldn’t do so on aloo gobhi page. Your dhabha style aloo gobhi looks amazing and I want to try it please let me know how much water to add after adding aloo gobhi, thanks. Keep up the good work. No issues simmi. I have mentioned in the recipe 2.5 to 3 cups water. 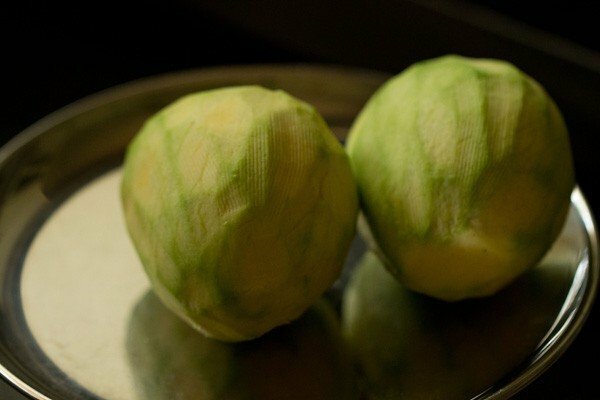 This gives a thin tari or curry to the dish. It also depends on the quality of both aloo and gobi and how long they take to cook. So you can adjust accordingly. 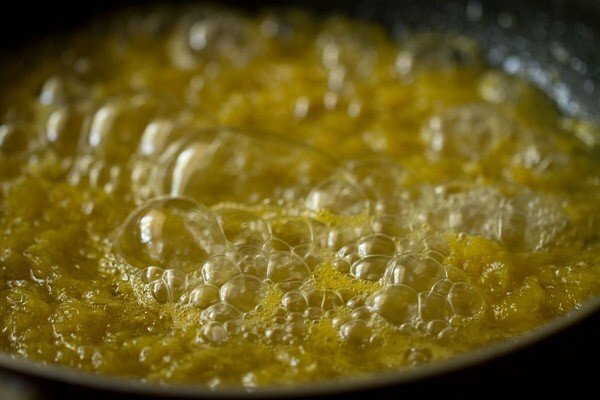 If cooking in a pressure cooker, then you can add 1.5 to 2 cups water. welcome neha. glad to read your positive feedback on recipes. nice to know that step by step recipe presentation is helping you. happy cooking. Very tasty…. I like your all recipes… It’s soo delicious.